At Motel Six you'll be within just a 15-minute stroll of Claphams Clock Museum and Tuatara Gallery. Highlights at this motel include free self parking and a spa tub. Free WiFi, TVs, and coffee/tea makers are featured in all 14 rooms. In-room dining is easy with amenities like fridges and microwaves. Additionally, hairdryers, irons/ironing boards, and free toiletries are available. This motel has free WiFi in public areas, barbecues, and dry cleaning/laundry services. Additionally, you'll find laundry facilities, tour/ticket assistance, and luggage storage. 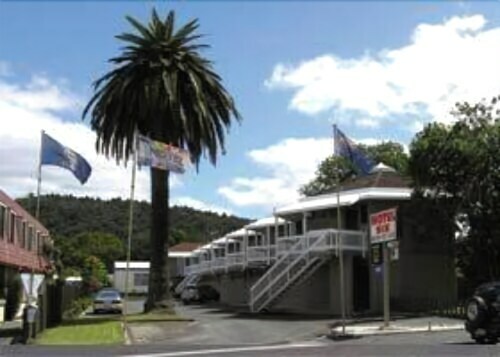 Sights within a 15-minute walk of this Whangarei motel include Whangarei Art Museum and Claphams National Clock Museum. Nice and clean, good communication for late checkin. Cons: The motel is quite tired and needs modernising. The beds are small and uncomfortable. The room needs air conditioning or at least a fan. Good location being close to the CBD. The motel is a bit run down and needs modernising. Room lacks air conditioning or at least a fan. Opening windows at night is not an option due to noise. Can hear other visitors in the up stair rooms. Very noisey. Good basic motel, well maintained and the staff were very friendly and helpful. As a guest of Motel Six, you'll find a hot tub, tour or ticket assistance, and a BBQ. WiFi is free in public spaces. Motel Six also features laundry facilities and dry cleaning/laundry services. Self parking is free. Motel Six offers 14 forms of accommodation with coffee/tea makers and a hairdryer. Guests can make use of the in-room fridges and microwaves. Bathrooms include a shower and complimentary toiletries. This Whangarei motel provides complimentary wireless Internet access. Housekeeping is provided on a daily basis. Qualmark® assigns an official star rating for accommodation in New Zealand. This Motel property has been rated 3 star plus, which is displayed on this page as 3.5 stars.